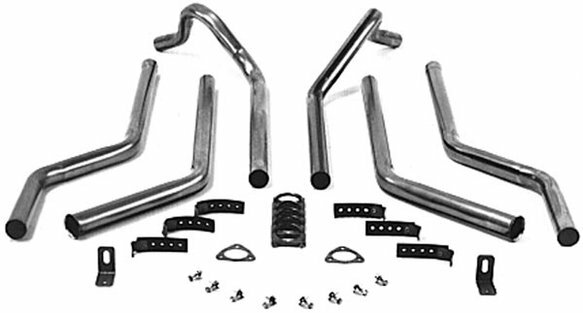 Super Street Header Dual Kit, Fits 73-87, 305-400 Engine, Chevrolet / GMC / Pickup, 1/2, 3/4 & 1-TON, 4 WHEEL DRIVE ONLY. See "Installation Notes" for specific fit requirements. For use with factory exhaust manifold system order sales #52525FLT. For direct fit using headers 51525FLT kit should be used with Flowtech Headers sales #11500FLT, Required Muffler "inlet and outlet" tube size is 2.25", Suggested mufflers: TERMINATOR sales #50121FLT or RAPTOR sales #50051FLT. FLOWTECH Super Street Exhaust Kits offer a top quality, custom fit dual exhaust system at a price that couldn't be more affordable. Kits include everything from the header flange back to the tailpipe, excluding mufflers. These heavy duty 16-gauge systems offer the maximum in versatility. Available for either header or stock manifold applications, FLOWTECH Super Street Dual Kits were designed to locate all components above the frame. All systems feature OEM exit locations and all parts and instructions are included.